I grew up during the Vietnam era. My grandfather had served in the first World War and I was raised to honor the military. I didn’t know anything about them, but they wore uniforms and looked like impressive people, so I respected them. Hopefully, I’ve lost some of my naiveté. When it comes to honoring the people who have served in the military, we’re getting better at acknowledging their sacrifice. As a society, we’ve largely stopped blaming them for the decisions of our political leaders. That’s a good thing. We haven’t arrived yet, but we’re definitely getting better. There are lots of reasons to join the service – love of country, a college education, a career serving the country and fellow citizens. Most such momentous decisions are made up of many influences. And, just like the rest of us, they don’t know where their decision will take them. For whatever reason, these young people chose to join the military, they are serving and protecting us, you and me. They are doing what we can’t or won’t do ourselves. They deserve our respect and our support. Memorial Day is the day that we honor those who lost their lives defending our way of life, defending our very lives. 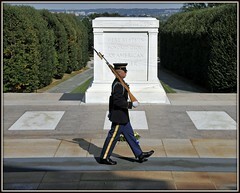 It’s great that it’s also a three-day weekend, but it’s a day to remember and honor our military dead. Wreaths Across America is an organization that places wreaths on the tombs of US military interred in cemeteries which are part of the national cemetery system. While it is right that we honor our dead, it is also essential that we support our returning military who have been wounded. The Wounded Warrior Project works with wounded veterans as well as those who are still recovering and in the military. Finally, those of you who follow us, know of Justin Crabbe who was seriously wounded in August of 2011, while serving in Afghanistan. Here is a story of how his community has come together to support him and his family.